Well that was a shock wasn't it? Last Friday, just over a week ago, it was announced that BAAF - the British Association of Adoption and Fostering was closing, immediately. Here's the statement from the BAAF Chief Executive. Through The Adoption Social I often see press releases, sometimes we get direct emails from adoption organisations asking us to share their news, but this news didn't arrive this way. I happened to see a tweet mid-afternoon on Friday and immediately got in touch with Sarah (from The Puffin Diaries, and my partner in crime on The Adoption Social) to see if she'd heard. After sharing the link to the announcement on The Adoption Social's Facebook page, I soon started to see others sharing and retweeting it, all with the same level of shock. I don't have much direct experience with BAAF myself, but my timelines on Twitter and Facebook are full of surprise, I even saw a thread on Mumsnet about it! Most of the core services will be operated by Coram instead now. So, service users/adopters/professionals/adoptees should not lose out. It might work well for all of us too? Fresh eyes on those services might mean some of them change and improve. Adoption Link - love them or loathe them - already run other services that fill in the gaps of the now Coram/CoramBAAF run services. This leaves space for newer, forward thinking organisations. As one of the main players in the adoption support (and I use that term loosely) world, you really needed BAAF onside to get heard or taken seriously, but with their 'traditional' views, communication methods and services, this was always going to be difficult for new/alternative/activist/small/modern organisations. Perhaps the tide is turning? Now is the time to look further to have your support needs met. You know, Adoption UK and BAAF are not the only adoption organisations that exist (or existed) - yes, there's Adoption Link and the First4Adoption website, there's Coram, Barnardo's and After Adoption. There's also The Open Nest, The Adoption Social, The Potato Group, individual adoptive parents, We Are Family, the new Single Adopters Network, The Yellow Kite, Post Adoption Centre, TACT, Family Futures and many more local organisations too. They might even be better placed to help you with your needs! My concern however is that if BAAF can't sustain itself, then can these other organisations? What is the wider implication of BAAF closing it's doors? And whilst Coram does a good job of supporting families in England, what of those in Ireland, and Wales who will be losing out? (Scotland are being looked after as some services transfer to a Scottish organisation). And how can Coram - even if the legal part is strictly speaking a separate entity - effectively and independently run the reviewing mechanism that they are taking on? What are your thoughts? 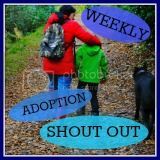 If you have a blog, then you can write a post and link up to The Adoption Social here. If you don't then please leave your comments below, or contact me and I might be able to offer you a guest spot here on The Boy's Behaviour. Ella and I haven't had that much to do with BAAF but friends that have speak quite highly of the group. I've said it before that the one issue that annoys and worries me the most is the way that experts meet to discuss issues without wanting to give the users of a system a meaningful voice. In my limited experience BAAF were not immune to this failing. I am afraid your analysis is terribly shallow and trust in Coram misplaced. Please dont make faux sympathetic statements about redundancies, every case is different and you cant possibly know. The demise of BAAF is not an opportunity for the others to move in either. This is not a light hearted subject but a black cloud for the whole sector. The questions that need to be asked are about probity amongst the trustees and CEO. The Mumsnet discussion is serious and impactful unlike your mysogynistic attempt trivialising it. Hi there anonymous - sorry you weren't brave enough to leave your name. I can assure you that my sympathy about redundancy is real, not faux, after experiencing redundancy (from a charity that lost it's funding) myself just a few weeks before beginning adoption leave - putting the whole placement at risk, and my husband's redundancy coming just 6 weeks before discovering our pregnancy. Every case is indeed different - but what is it that I can't possibly know? How horrid it is to suddenly lose your job? How impactful is can be on every part of your life? Whether redundancy is expected or not, it's unpleasant at best. I agree it is a black cloud for the whole sector, however, there are still some organisations that exist and with the disappearance of BAAF, adopters - readers of this blog, need to know where to turn for support. I'm not using my blog to 'move in' and I haven't seen anyone else try to move in yet either, but it would be wrong to ignore the other support that is there. This blog - (my blog - my opinion by the way) is not attempting to trivialise the mumsnet discussion and I very much disagree with your calling me misogynistic, just sharing my shock that on a site that I personally have found less than supportive of adopters (and I even worked for mumsnet for a time! ), there was a discussion about the subject - before it even hit the main news sites such as the BBC! Whilst you are entitled to your opinion on the closure of BAAF I would think it wise to research your opinions of this blogger before making such rude and inaccurate comments. How you can consider @Boysbehaviour misogynistic is laughable. This is a person who spends large amounts of her own time, unpaid, support many adopters and adoptees, most of which are women. She is a kind, considerate and highly supportive human being, I know her well and the last thing she would do is make false statements of sympathy over such a serious subject as redundancies. If the reason you have remained anonymous is because you are some how involved professionally with Mumsnet, you are no doubt aware that your comments are unfounded, not constructive and down right rude and that is why you have chosen to be unidentifiable. How much better it would have been if Mumsnet had engaged in a constructive discussion around the content of this blog, rather than this childish, name calling. Very confused about the misogynist comment. But anyway, thank you for the really useful list. I have looked up lots of these websites now and found resources I wasn't aware of before. Thanks! When we adopted, over 40 years ago, there were no help sites. There was one social worker who knew something of adoption but she lived in a different city. After a while we began to get social workers visiting to ask what they should look for in adoptions, what problems might crop up and what did we think was important. I referred them to the one book I had found on the subject and let them play with the children for a while. The only problem was the anxiety waiting for the adoption papers to be finalised.